Long ago, a man committed an unspeakable sin in an attempt to satisfy his incredible greed. As punishment for his crimes he is cursed to walk the earth for all eternity as a stranger to man and a witness to the destructive nature of greed. Keeping a vigilant and watchful eye on the happenings of the universe, the enigmatic Phantom Stranger is forbidden to interfere. However, during world threatening crisis, the seemingly all-knowing being has been known to appear and sway heroes towards the path of victory. 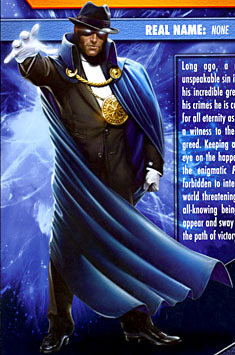 That bio is only one of the Phantom Stranger's potential origins. Until the New 52 nailed him down (no pun intended) as Judas, the character had gone six decades without having a real name or origin. There was an issue of Secret Origins that focused on him, but it gave four different, equally valid options for who he was. And since the very point of him is that no one knows who he is, choosing one origin to be the real one is stupid. Though he's part of John Constantine's nominal "Trenchcoat Brigade," Phannie doesn't wear one - since the beginning, he's always worn a suit with a cape. To that end, the figure uses the standard Mattel "suit" arms and legs, though he does get new gloved hands since no one else had his particular combination of style and pose. The jacket is the same as Black Mask's, but the torso beneath it is new: instead of a shirt and tie, he wears a turtleneck. Because when you're fated to live forever, you want to dress casual. He has a new head with a new fedora, and his cape has a large folded collar just like Martian Manhunter's, but it's not the same mold. And that brings us to our first problem with this figure. The cape is clasped by a golden chain, which is accurate. 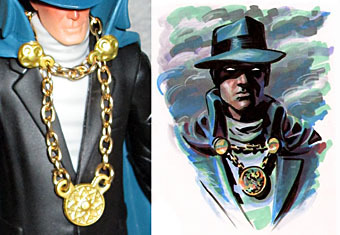 Then he's also wearing a big medallion on a chain, which isn't accurate. Yes, he had a medallion in the comics, but it wasn't a necklace: the chain that held the cape closed was the same one that held the medallion; basically it was one chain that formed a triangle on his chest, not two chains that overlapped. 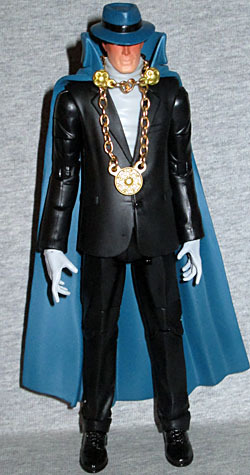 Credit to this figure for the real metal chains (and the nice detail on the disc), but it's not done the right way. Our second complaint has to do with the paint. The artistic conceit of the Stranger is that his eyes are always concealed in shadow, so like Snake-Eyes, he's painted with a permanent shadow. It looks like a sunburn. It's better than the effort on Raven, in any case. So that's not the problem. No, the issue is his hair: since day one, every appearance of the Phantom Stranger has showed him with white hair; this figure's hair is black. Uh, whoops? That's a pretty major mistake. The Mike Thompson portrait on the back of the box is kind of a mixed bag this time. The head is great, with the light spilling over his hat in such a way that the harsh shadow on his face looks completely natural. His eyes are glowing, with just a bit of light trailing off to the sides through the darkness. His posture is good, with the left hand holding his cape as it billows around his legs, and the right reaching out in that typically cryptic way he has. Is he threatening us? Offering to help? We just can't tell! So that's all good, but the proportions are just a little bit off. The medallion is as big as his entire head, which seems excessive. Okay, that could just be a stylistic choice, though, so we'll leave that alone. And the right hand is large, but that's just forced perspective. It took me a while to figure out what was bugging me, and it turns out to be the left shoulder. It's under the cape, so we can't see it, but judging by the way the cap hangs, it doesn't look as though the arm is actually attached to the body. Either that, or he's got those freaky-wide Four Horsemen He-Man shoulders. 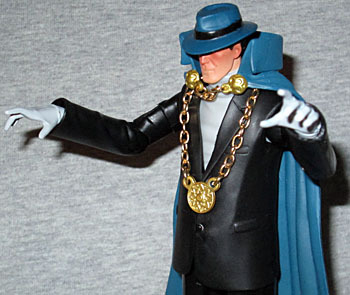 Oddly enough, this isn't the first time Phantom Stranger has had an action figure. He's not exactly toyetic, but DC Direct made one in 2002. This one is better, obviously, and has nicer packaging even if we did just pick on the art a little. The Phantom Stranger isn't for everyone, but he'll do great if you're building a mystical DC collection with guys like Deadman, Etrigan and Swamp Thing.